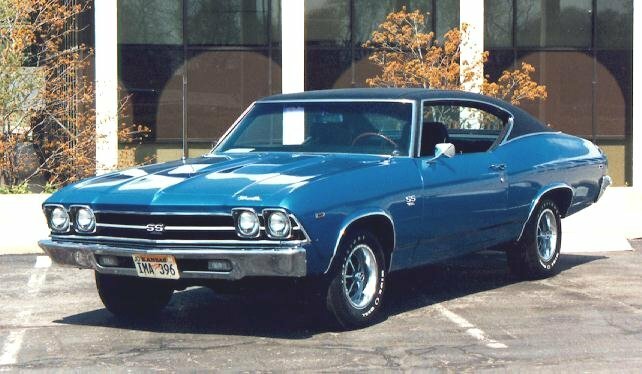 I've got a 69 Chevelle. I have moved the battery to the trunk. Added a one wire alternator, and a MSD. The car starts and drives, because I wired the starter and MSD directly to the battery. However it's got an electrical drain and many of the accessories don't work. Lights work. Dash Lights work. I've got the MDS on a kill switch. No heater. No radio. No wipers. Anyone got a clue? What did I do wrong? Probably a lot... lol. In stock configuration, there's a wire that runs from the Battery to the Fuse Box by way of the Voltage Regulator. Is that wire still in use? Do you have a wire from the chassis to the ( - ) battery pole? Ground the battery to the frame rail AND run another ground cable the body. As Bruce asked, do you have power to the fuse box? If you bypassed the ignition switch power you won't have accy's, heater, radio, wipers. Actually it's by way of the horn relay, fed from the terminal on the core support which is fed from the fusible link from the battery. Make sure there is 12 volts at the BAT terminals on the horn relay. I would put the battery back where it belongs then the frame does not need a ground. The battery is grounded to the frame with the battery cable. The only other ground wire to the battery is the black wire for the MSD. There are two hot wires from the battery. One goes directly to a one wire alternator. One goes inside to the MSD on the kill switch and then has a jumper wire that goes back out to a small junction point on the firewall (outisde) which has multiple hot wires connected that go all over the damn place, including to the starter... That's probably the cause of the problem. Although this may not be an issue (at this time), if you have regular motor mounts (rubber), you should have a starter capable jumper between the chassis and engine block. I have a 1965 Chevelle with battery in trunk. I run a wire from the alternator to the power block located by where the battery use to be in the front. The power block has a wire that goes across the radiator core support to the horn relay that then goes to all the dash stuff inside car. Then on the power block I run an 8 gauge wire all the way to the back to the battery. The battery in the truck has a wire that goes to the starter and the ground wire that goes to the frame and I also have a wire from the frame to the body. The body needs to have a ground between it and the frame. My MSD is tucked in where the battery use to be and with the power block there it is a short wire to MSD. Also where the battery use to be I have my wiring and circuit breaker for the radiator fans. You will find that having battery in trunk gives you some room up front to put things like MSD, oil catch/breather can etc. How about a ground to the body? You will find that having battery in trunk gives you some room up front to put things like MSD, oil catch/breather can etc. mino65, hydro462, 68-13427 and 2 others like this. Interesting catch can for the radiator! I think my issue is that I am not getting power to the fuse box. I have a hot that runs from a junction point to a regulator up front by the headlights on the driver side. I think that is supposed to run back to the fuse box for power, but I am not sure if that is working. I ran a wire straight from the battery and plugged it into the ACC and IGNT on the fuse box and low and behold when I plugged it into the IGNT port my turn signals started working. The ACC port did nothing, bit the Ignition port suddenly powered the turn signals, which I think is a backwards wiring. Ryan, feeding from the battery INTO any of the ports on the fuse block (IGN, BATT, ACC) is NOT how to feed the fuse box. There is a red 12 gauge wire that goes into the firewall bulkhead connector under the brake booster. It's the main positive feed to the fuse box. This wire should go to the positive of your trunk mounted battery with a fuse at the battery to protect the run. A 25 amp fuse should suffice. As you've moved the battery to the trunk, make sure you ground it's negative to the engine block. OR you can ground it to the rear chassis then add a same sized cable between the front chassis to the engine block. You also need to ground the body to the battery negative. Did you check to make sure there is 12 volts at the BAT terminals on the horn relay?